1. P1261, P1265, P1267 - These look like 3 glowplugs. I noticed the images for the replacement walkthrough on the forum dont display anymore. I'm a visual guy, does anyone have any other source for a replacement procedure, images or video? Also realistically how long would this procedure take for a diy-er and what would a garage charge for the labor? I did my timing belt myself, but man my CRD is just so greasy and sooty I loathe working on it, but I'm cheap so I usually do. 2. P0102 - MAF sensor. I expected this one as my MAF plug was disconnected, but I re-connected because my smog is due in a few weeks, and after several long drives the code is still not going away. What are the possibilities that I should look into to get rid of this code? This same thing happened to my maf. I had it unplugged for a while but when I plugged it back in it was still throwing a code. Bought a new maf and it went away. The glow plugs can be tough to get to and can be in there pretty tight. It’s worth getting in there with pb blaster to hopefully loosen them. Glow plugs - go to http://colorado4wheel.com/manuals/Jeep/KJ/ and download my tech tips PDF; scroll down to glow plug service in the bookmarks. MAF - length of drives won't clear the code assuming the MAF is good rather it's the number of drive cycles (from cold to hot) which is like 5-10. But first pull the plug; check and clean the contacts; replug making sure the plug lock is fully engaged. I didn't realize it was that many drive cycles, maybe Ill give it more time before I assume something is bad. Ill clean the contacts too. Ive been putting off replacing a stuck thermostat for a while so my engine really doesn't get to full operating temps unless I do spirited (for a CRD) stop and go driving. I wasn't sure what actually triggered a completed "drive cycle", I think I read somewhere its the radiator fan coming on? I cant get mine to come on at all this time of year unless I turn the ac on and turn my heat to max, not sure if that counts though. -I pulled all the intake hoses, the turbo to intercooler and intercooler to manifold hoses look good to me, cleaning them up now. -The airbox to turbo hose is falling apart around the turbo c-clamp area but not enough to make me think it was leaking. I'm ordering a new one anyway. -The FCV isn't stuck, it moves freely. Does this mean the entire part is ok or is there any other test I can perform to rule this piece out as being the problem? -Anything else I can check that could be the culprit? Vacuum lines? If so specifically where and what should I check? I have no idle issues. I do notice a slight lack of power when accelerating/climbing hills, the turbo spools up hard/loud but the car doesn't go very fast. Have you tried cleaning the MAP sensor in the intake manifold? Edit: For code P0299. As I understand, MAP is a baseline pressure reference to calculate boost pressure. Also, how clean is your air filter? i have cleaned it a couple of times over the years, the last time i pulled it, it was pretty clean. Thanks for the suggestion though. Ha! I guess I would have know if I'd read your signature. Have you verified the maf is working with something like torque pro? As I mentioned above, mine was unplugged for a while and when I plugged it back in it was dead. I bought a new one and it fixed the code. The maf isn’t needed so if you were willing to do a DIY or GDE tune the code would go away. I haven't ruled out a bad maf yet, but didn't want to just start replacing parts until I was sure I had checked everything I could first. Ill see if I can use my app to verify if its working, for some reason torque doesnt seem to work with my specific elm27 obd reader though, it wouldnt pull codes and I had to download something else. The default (no vacuum) condition of the VG Turbo is high rpm - max boost. If there is any leakage, kinkage or breakage of any component between the turbo and the vacuum pump, it can be unable to properly direct exhaust through the turbo, and it will not spool up at early or light throttle as it should. This causes underboost, and will trip the MIL light usually at very light or off-line accelerator condition. The default (no vacuum) condition of the VG Turbo is high rpm - max boost. The no vacuum condition for the turbo is low boost. High vacuum = high boost. I can see why this is confusing because at idle vacuum to the turbo actuator is high. This is only to reduce turbo lag when accelerating from a stop. Even with the actuator set at high, there is not enough exhaust flow at idle to produce any boost. But if you bypass all the vacuum solenoids and just run high vacuum to the turbo actuator, you wont drive very far before a overboost code is set and the engine goes into limp mode. The problem could be one or both of the vacuum solenoids. You can bypass the small solenoid to see if that improves anything. Well good news and bad news for me. Good-Got glow plugs replaced, EGR cleaned out and air hoses cleaned/replaced. Car runs much better now. I manually cleared my codes. This is the 3rd time i've been to this shop for smog over the years, first time with this issue, kind of concerned. I searched around and read that our obd ports are finicky with some scanners (ive had this problem at a pepboys before) but I would just assume a smog shop shouldn't have this issue. The guy told my wife its the first time its happened to him so he didn't charge her anything. I'm not sure what to do, go to another smog place? Go to the dealer and have them perform the F31 recall I read about? Relevant info: 2006 CRD, I had the battery disconnected for a week while I worked on the car. When I re-connected battery, the check engine lights still remained (P0102, P0299, P1261, 1265, 1267), I used my ELM27 scanner to clear the codes, then drove over 300 miles over 5 days before taking it to smog. The guy didn't say the obd data wasn't ready, he said he couldnt connect to it at all with his scanner. I verified I could still connect to it with my elm27 too tonightl so I don't think its a problem on my side or could it still be somehow? I checked the port pins and don't see anything that looks physically wrong. 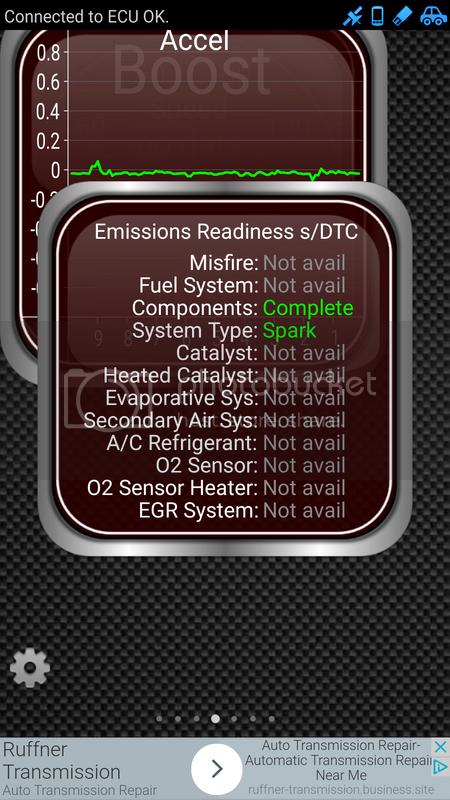 This is my current status, should I expect to see the egr or anything else report as ready or is this all the card should report via the obd port?